Mmm… crispy on the outside, soft and warm on the inside. The strong flavors of scallion and cilantro paired with a creamy, dill-yogurt sauce really make this dish stand out. When faced with something that is so fun to make and tasty to eat, how can you resist? This recipe definitely deserves to make it onto this week’s dinner menu in your house! So… what exactly is a bolani? Well, a bolani is a vegan, unleavened, stuffed flatbread. It can be either savory or sweet, featuring fillings such as spinach, lentils, pumpkin, or potato and scallion (what we’re making today!). Bolanis are unique to Afghanistan, and are often served by street vendors or as an appetizer or side dish at special events and parties. Often enjoyed with chutney or yogurt sauce, this dish is treasured by many, Afghani or not. All that said, tell your tastebuds to get ready: here comes the bolani! First we need to make the dough. Mix together salt and flour in a bowl. Stir as you gradually add in water and oil. 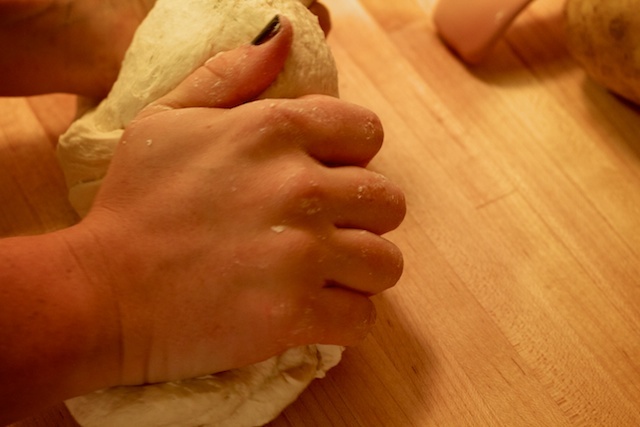 Once the dough forms a ball, remove from bowl and knead for 10 minutes. 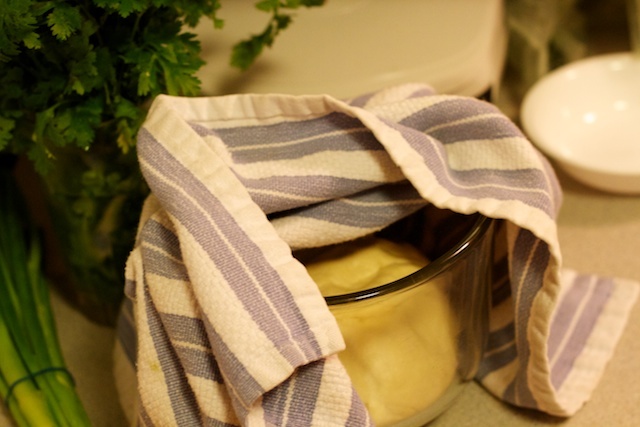 Place kneaded dough in a lightly oiled bowl, cover with a towel, and let rest for one hour. 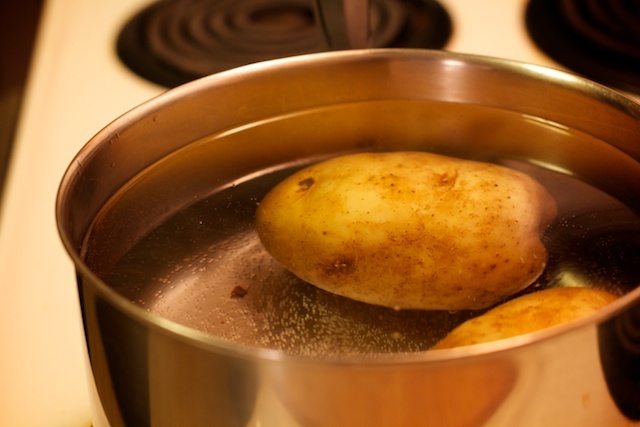 Scrub potatoes, place in a pot, cover by two inches with cold water, and bring to a boil over high heat. After 20 minutes, check to see if the potatoes are done. Poke a skewer or knife through the center of the potato. If it easily goes straight through, drain the potatoes and set aside for 5-10 minutes to cool. Try not to check the potatoes too often; if you do, the holes allow water to get inside the potatoes as they cook. You may need to remove smaller potatoes before the larger ones finish cooking. In the meantime, go ahead and mix together your yogurt sauce! Peel and quarter the potatoes once they are cool. Mash with 2 tbsp olive oil, salt, and pepper. Try to get this as smooth as possible, but some lumps are ok. Add in cilantro and scallions, mash thoroughly to combine. Lightly flour a flat surface to roll out your dough. 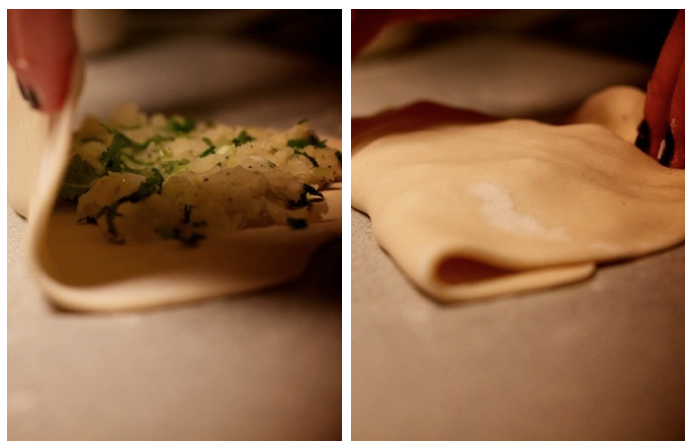 Take a ball of dough, roughly the size of a small apple, and roll. The dough should form a tortilla shape: very thin and about 10-12 inches in diameter. 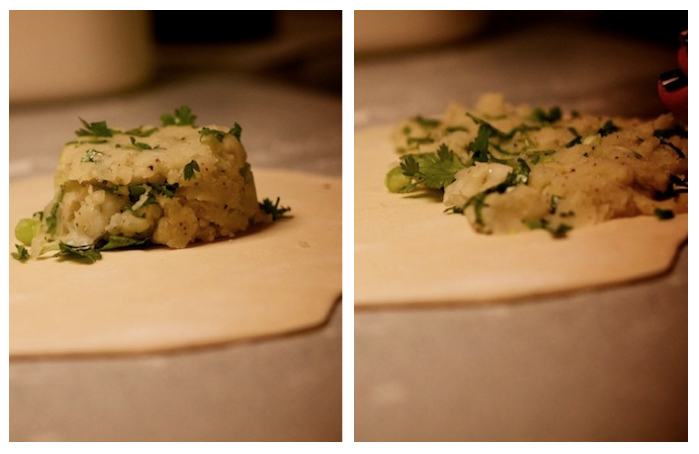 Place a little more than 1/4 c of your mashed potato filling on the rolled dough. Spread over one half. Flatten the bolani, removing any excess air that may be trapped. Press down the sides to seal the bolani. You should end up with something that looks like this! Beautiful! 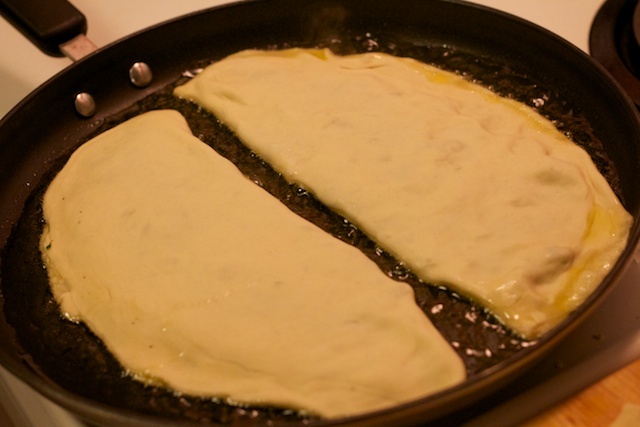 Fry the bolani two at a time in a large pan with 1/4 c olive oil. The oil should be hot enough that the bolani sizzles when you place it in the pan. It takes just a couple minutes for each side to get golden and crispy. 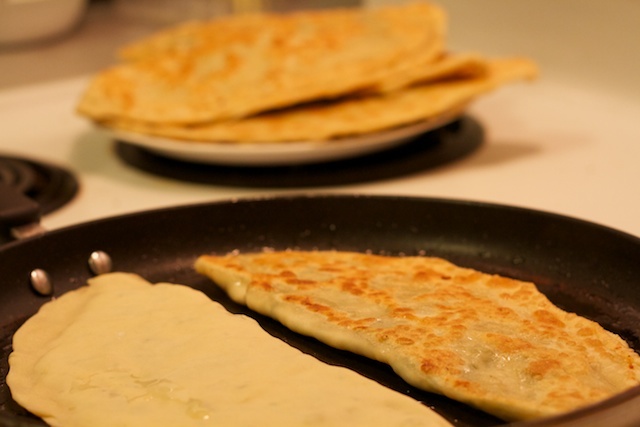 Place finished bolani on a plate or paper towel, and continue cooking the rest. Add more oil as needed. These are best served warm, but if you want to save them for later that’s ok too! Serve with yogurt sauce. We loved the flavor of this popular snack and we’re sure you will too! Nooshe jaan, friends! See you next week. 1. Mix flour and salt together. 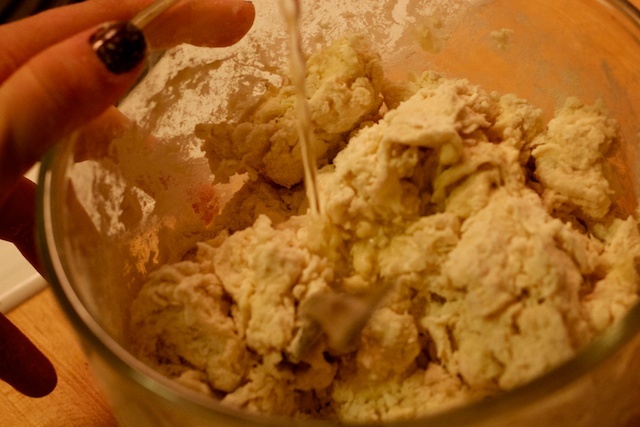 Gradually (while mixing) add in water and oil until dough forms a ball. 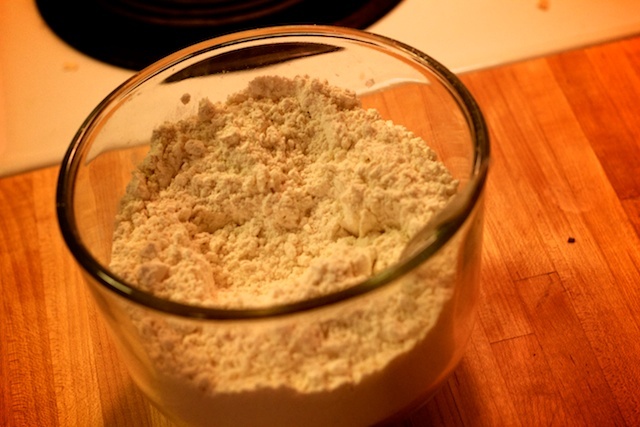 If the dough is too dry, add more water one tablespoon at a time. 3. 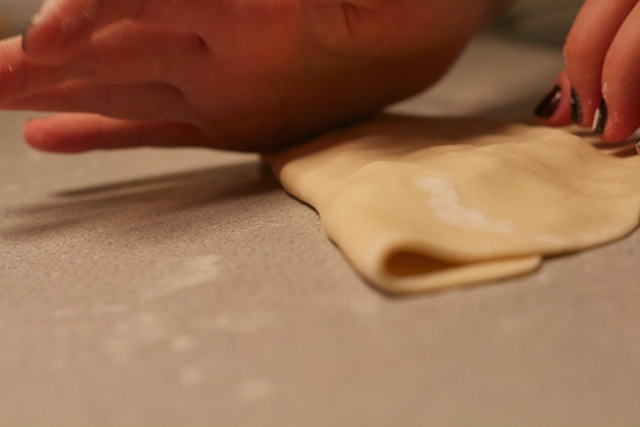 Place dough in lightly oiled bowl, cover with a cloth, and let rest for one hour. 4. Scrub potatoes clean, place in a pot, cover by 2 inches with cold water, add a good pinch of salt, and bring to a boil over high heat. 5. After boiling for 20 minutes, check to see if the potatoes are done by poking them with a skewer. The skewer should easily pierce through the center of the potato. Try not to check the potatoes too much, as the holes allow water to seep into the potatoes as they cook. Smaller potatoes may get done sooner than larger ones. 6. Once the potatoes are done, drain them and let sit for 5-10 minutes. 7. Peel and quarter the potatoes. Mash with 2 tbsp olive oil, salt, and pepper. Try to get this as smooth as possible, but keep in mind having some lumps is ok.
8. Add in cilantro and scallions, continue mashing to combine. 9. Take a portion of the dough (about the size of a small apple) and roll it into a smooth ball. 10. 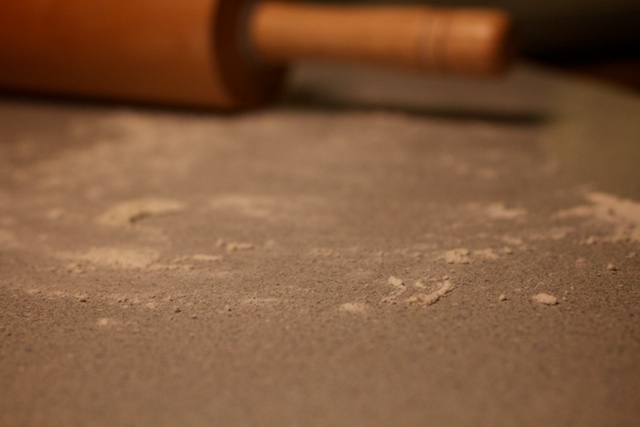 Spread some flour onto your surface, and roll the ball with a rolling pin. The dough should be as thin as a tortilla and have a 10-12 inch diameter. The thinner, the better! 11. Spread a little more than 1/4 c of the filling on one half of the dough, leaving about 1/4 inch border around the rim. 12. 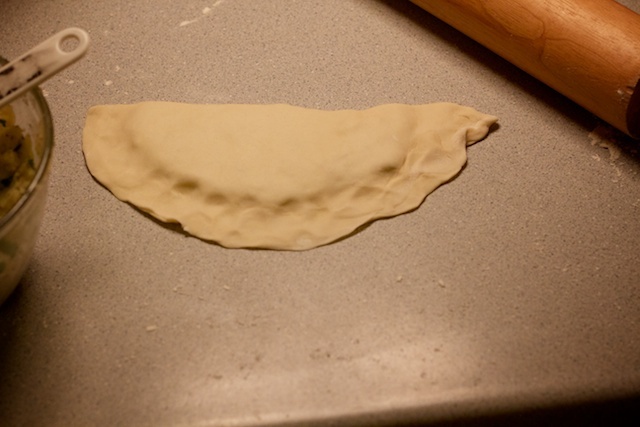 Fold the dough in half over the filling and press to seal. If necessary, continue pressing and flattening the bolani to remove any excess air inside the pocket. 13. Heat 1/4 c olive oil in a pan. The oil should be hot enough that the bolani sizzles when placed in the pan. Brown the bolani, two at a time, until golden and crispy on both sides. This will only take a couple minutes on each side. 14. Place cooked bolani on a paper towel or plate as they finish. Add more oil to your pan as needed while you cook the rest. 15. 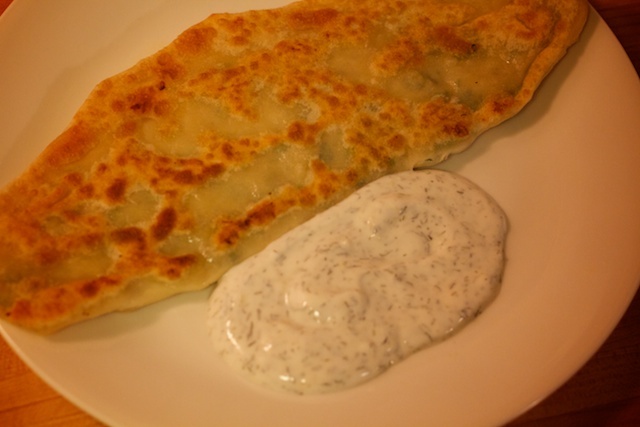 Serve warm with a simple yogurt sauce of plain yogurt, garlic, dill, coriander, and salt. Welcome to the Weaving Life Blog. Come join us as we continue on a journey that was started by one man many years ago. We are a group of 7 students from Eastern Mennonite University who are looking to continue telling the story of Dan Terry, a man who was dedicated to helping and living with the people of Afghanistan for 40 years. Dan was killed in 2010 along with nine other humanitarian aid workers while he was working in Afghanistan. Dan’s story goes much deeper than the story of his death. He was a remarkable man that loved adventure, but even more he loved the people whom he served. Weaving Life is the story of Dan’s life, but calls for more than just a tribute. Through stories, conversations, recipes, and images we hope to continue the conversation and bring people of all faiths and communities together.